North 40 Mini Golf Course - Des Moines & Sioux City, Iowa. We look forward to seeing all of you again this summer! This is a great place to bring your group. Throughout the season we have many childcare providers signing up for outing dates. Each course is in a shaded, outdoor setting. You are welcomed to bring your lunch or refreshments. We have a clubhouse with picnic tables, a gazebo, and about 5 other picnic tables scattered throughout each course. Our courses are open 7 days a week for scheduled groups and we will open earlier than Noon for a group of 25 or more. All hours are weather permitting, so rain dates should be given at the time of scheduling. For more information or to schedule this activity for your group, please call your nearest North Forty location. P.S. To keep hydrated during warm days, please remember to bring paper cups for all of your children and we will be happy to fill them with water for you! 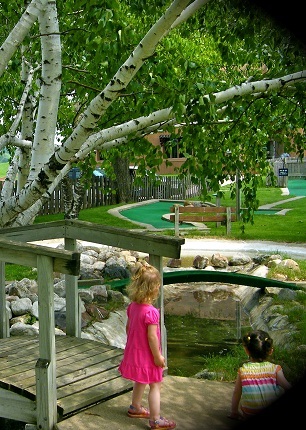 North Forty Mini Golf - The Best Miniature Golf in Des Moines & Sioux City, Iowa. Copyright © North Forty, Inc., All rights reserved. North Forty Mini Golf.